Left picture is Inspector 1 Rene at work inspecting. Right picture is Inspector 1 Rene relaxing after a busy day of inspecting. Rene is a long, slender black and white cat with 14 pounds of attitude. We refer to Rene as The King because of the way he commands attention from employees and customers, alike. He likes to greet customers as they arrive through the door and challenges anyone to tell him different. 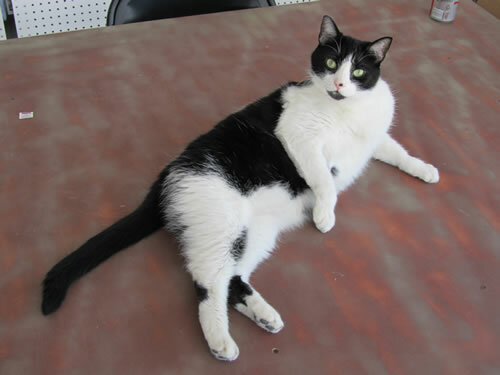 Rene spends a lot of his time lying on the game tables and taking in the good life, watching who he can command next. Rene came to us in 2008 as he was abandoned to fend for himself in the wild desert after having being declawed and defenseless. Fortunately for all of us, he found us and took refuge in our garage where we came to meet. It was not long before he used his genius and charm to win us over, about an hours' time to be more precise. Rene enjoys supervised walks outside and has a flawless internal clock that to tell him so. While packing products for shipment, he will stand by our side and ensure your parcels are accurate as they are pulled and placed in their respective boxes. Rene likes to follow us around the store and warehouse ensuring the correct products are picked. While doing so, he also enjoys a good chase and hide- and- go seek. It is a rotational thing at that, where he hides and we seek, then in turn, we hide and he seeks. A truly cool cat! Unfortunately, his fetches are not up to snuff; meaning we toss, he glares and we fetch. You can read his eyes saying, "You have got to be joking, right". Oh well, you cannot win them all. 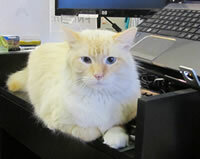 From time to time, Rene will get up on the counter and offer our customer their receipt from the printer. It may be a little wet and tattered, but luckily, nobody really seems to care. Rene has many nicknames such as Your Highness, Master and Sir Rene where he acknowledges all. The picture on the left is Inspector 2 Buster hard at work. The picture on the right is Inspector 2 Buster relaxing after inspecting boxes all day. Buster, code name, Boo Boo; came to us in 2011 from the wilds of the city. Buster should have been named ChooChoo or Loco because when he was no bigger than your hand, he had a tail that was twice his body length. 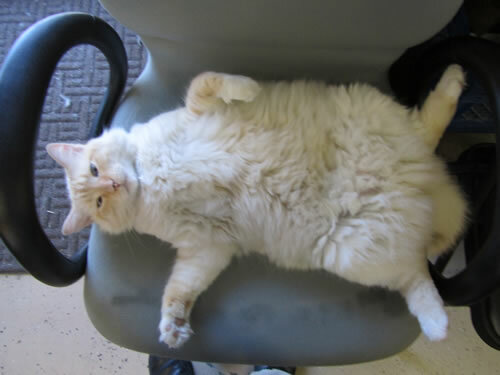 It was so big that he could not lift it as a kitten but could run so fast that you could hardly see his legs moving but his body stayed perfectly level; while his extra large tail was his freight. Why do we call him "BooBoo" you ask? Because in the middle of the night, something invariably goes bump in the night and we know right then that Buster made anther booboo. Buster is not the most agile of cats, but at least he can lift his tail now. He weighs in at 14 pounds and is all paws, head and hair. We had to laugh so hard one time because Buster had picked up a hand duster by the handle and was frantically running through the store. We figured he thought he had mistaken it for his tail and was looking to reattach it. When Buster gets up from a long nap, his pretty blue eyes are crossed for about a half hour till he comes to grips with the new day and he is off on his next adventure. 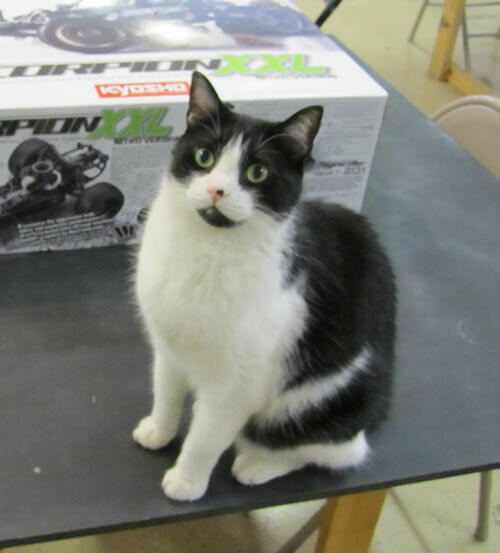 Buster enjoys actually sitting on our packing table and inspects the products as they are placed in the boxes and taped and labeled. From time to time, he gets wound up in the tape gun, so if you see some white hair you will know Buster was really checking up on our packing that day. Buster really is not a people cat like Rene and picks and chooses his companions, but he is always loving and affectionate towards his immediate family. The picture on the left is Inspector 3 Alex making sure everyone is hard at work. The picture on the right is Inspector 3 Alex looking to see where Buster is at so she can hide. Alex, short for Alexandra, has been with us since 2004. Alex is the queen of all our cats and doesn’t put up with garbage of any sort from any other cat or human. Alex lived in a gutted out trailer for over a year when she was younger and to our endless avail, were never able to capture her interest into becoming domesticated. We would sit on the back porch and watch her through night and day where she would find her days’ meal and go back into hiding of this old trailer in the back field. Finally, one day, Alex took an interest in us as we worked to lure her in. After setting out food and talking to her, she came closer and closer but always remained out of arm’s length. Finally, one spring day as we were walking across the yard, we heard a meow from our footsteps below. Low and behold, Alex came running to our side and walked with us without fear or hesitation. We were astounded by her sudden change in attitude and gleefully picked her up as she was not opposed from the sudden change in character. Ever since that day, Alex has been an adoring, yet demanding little girl who has given us uncompromised love. We found Alex is not your normal cat, but when considering cats, what is normal? She has the ability to open doors and drawers, climb in and close it behind her literally in a blink of an eye so she would not be found; essentially, the kitty version of hide and go seek. Alex is not necessarily the inquisitive type that you’d expect of a cat, but instead will hold a statue like posture for over 30 minutes without blinking an eye. 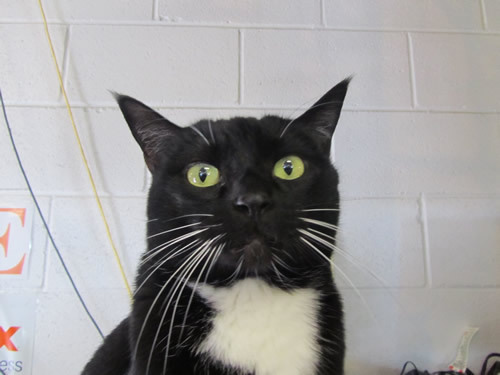 We’ve had customers come in as they took notice to this beautiful black cat with glaring green eyes and say, “ Is that a statue, it looks so real!”. I assured them it is a living, breathing cat taking in the sites. 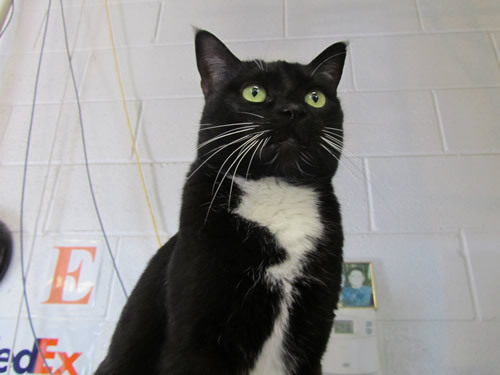 When not in her statue form, Alex enjoys lying in the window within the sun’s rays taking in the heat or demanding cuddle time with her favorite human, being Craig, our webmaster. This does take time away from his duties, but when your master insists you cuddle, well, you just do it! Alex’s favorite food is Fancy Feast Fillet Mignon or Chicken dry morsels and absolutely nothing else will do. She does maintain a rivalry with Buster but we’re not sure if it’s because he likes her or she just hates him. You will never find inspectors like ours when shopping with online malls. Just like shopping at the local mall in the good old days, prices were typically more but you had a vast selection of stores. Mall stores always paid a premium rent to the mall owners to be at that specific mall, the same goes for Amazon, Sears, Jet, Walmart and many others. By shopping directly with us on Wondertrail.com, we don’t pay these absorbent added fees, which means we can give you a great price all the time. Couple our great prices with Wonderpoints and added coupons and you simply cannot find a better place to shop for the items we offer. We are a brick and mortar store with a large online footprint. We are veteran owned and run. We use state of the art software in fraud detection and prevention that protects all parties. We do not offer express shipping or two day deliveries and never intend to, all this does is add cost and confusion to the overall purchase experience. We simply do it better without the frills and most importantly, without a membership.